The purple boundary in the map below outlines upper Richland Creek's watershed. When it rains, water that falls within this boundary eventually finds its way to the creek. The white boundary in the map below outlines the City of Forest Hills. The orange, brown, green, blue, and gray colored polygons within the map highlight varying land uses occurring within the City. Click the various polygons to uncover varying stewardship recommendations based on these land uses. The section of Richland Creek that runs through Forest Hills (blue line in map above) is considered unhealthy by the State of Tennessee as a result of three problems — Pathogens, Nutrients, and In-Stream Habitat Alteration. Nutrient issues in streams result from over-fertilized urban lawns and gardens. Other sources include pet waste, municipal wastewater systems, and dishwashing detergent. When fertilizers exceed plant needs, are left out in the open, or are applied just before it rains, nutrients can wash into our waterways over land or seep into groundwater. High concentrations of nutrients, found in human and pet waste, all too often contaminate our waters via leaking sewer lines or neglected pet waste. 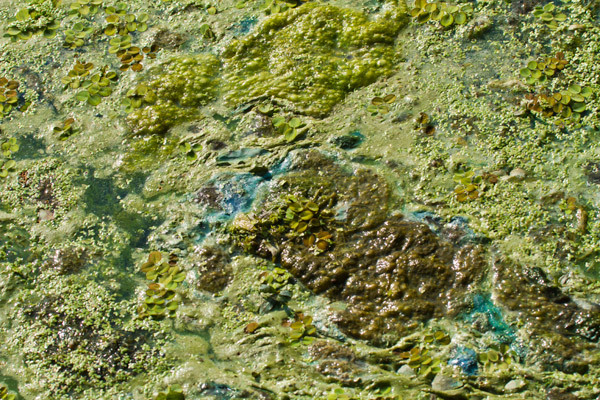 Increased nutrient concentrations cause nuisance or toxic algae blooms in waterbodies, killing fish and aquatic life. High concentrations of nutrients must also be filtered from our drinking water, since they can cause methemoglobinemia, also known as blue baby syndrome. HOW TO HELP WITH THESE PROBLEMS! This stewardship activity will address the pathogen and nutrient problems in Richland Creek. This stewardship activity will address the pathogen, nutrient, and in-stream habitat alteration problems in Richland Creek. Excluding farm animals from Richland Creek and providing them with alternative sources of water can prevent these animals from trampling streamside vegetation and defecating in the creek. Only use fertilizers when it's absolutely necessary. Follow application directions, and use only in recommended amounts according to the needs of your soil. Do not apply fertilizers before rainfall. This stewardship activity will address the nutrient problem in Richland Creek. This stewardship activity will addresses the in-stream habitat alteration problems in Richland Creek. Remove unused dams or other human-made stream obstructions. If you have an antiquated or unneeded dam or stream obstruction on your property, contact the Cumberland River Compact to discuss the feasibility of removing it. Walk the stream and inventory the location of any dams or obstructions, and let the Compact know so we can add these to our database or potential removal projects. This stewardship activity will addresses the nutrient and in-stream habitat alteration problems in Richland Creek.